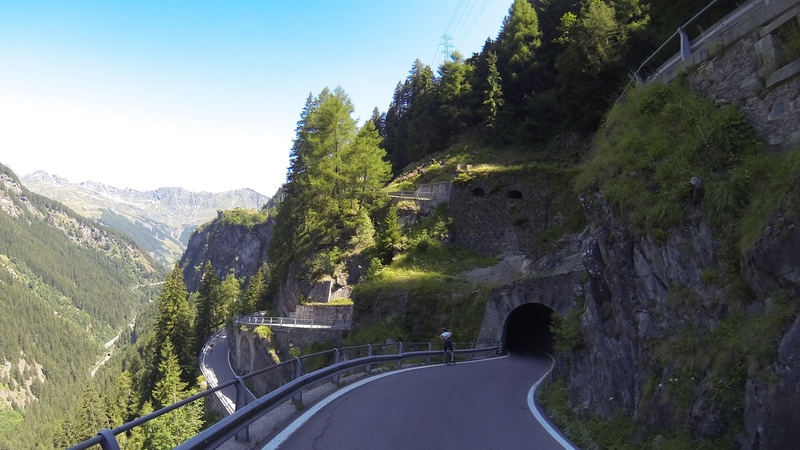 With Lucy’s Cent Cols dominating late summer 2015, the story of July’s Tour de Suisse was never properly told, which was a shame since it was a stunning ride. So here it is, accompanied by Jimi Thomson’s superb pictures (click on any of the pictures to view full screen and then use the back button to return to this page). It was 6th July 2015 and I felt like I was about to spontaneously combust. A quick glance down at my Garmin confirmed it was 43.5 degrees centigrade. It was even hotter in the sun – probably 50 degrees or more. I’d been thinking about stopping for the last three hours, wondering at what point I’d ride myself into a serious physical problem. We were on the fifth col of the day and like the last two, this one faced south and was full in the sun. I coasted to a halt at the side of the road, climbed off my bike and sat down in a patch of shade. I’d never climbed off my bike before. Ever. Petra, my friend and three times World Mountain Bike Downhill Champion, was riding beside me: she looked both amazed and concerned. Some ten minutes later, I clipped back in and slowly climbed the final km to the summit of the Col du Corbier. I told Jimi, our guide from Two Tyred Tours, that I was going to join him in the van (aka Mission Control, aka Erika), at the bottom of the descent and Petra and I set off for an exhilarating drop to the valley floor which felt like riding through a hair dryer turned up to full heat! Morzine-Avoriaz: James and SGL climbing through the afternoon heat. Photo by Jimi Thomson. 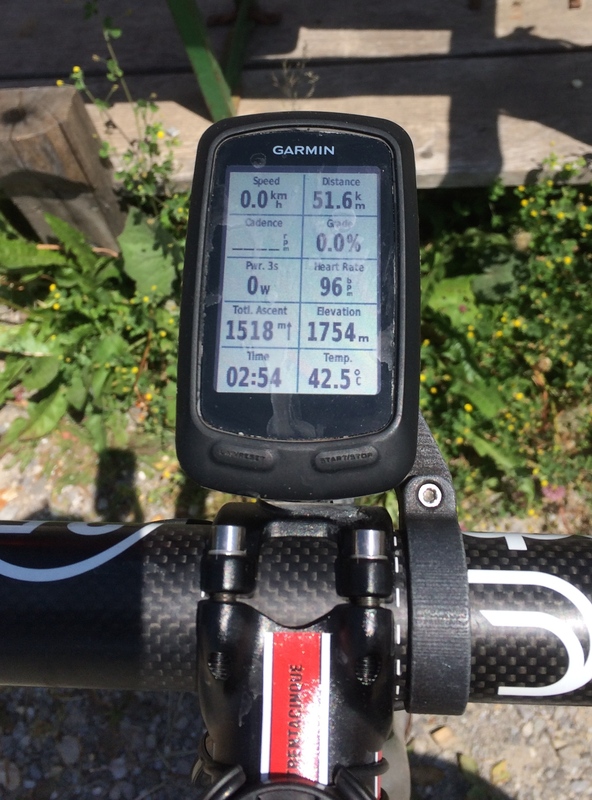 It was Stage One (158km, 4,440m), of our 2015 Tour de Suisse and it didn’t bode well. Petra, who lives locally, had only joined us for this final section of the day and very kindly climbed into the van beside me, so I wouldn’t feel like quite such a singular failure. Up the road, we passed my four companions on the remaining 15km drag up to our hotel – everyone was suffering, but they seemed to be coping with the heat better than me. This was always going to be a big, ambitious ride, but when planning the route some twelve months earlier, it had never occurred to me that we’d coincide with a European heat wave. 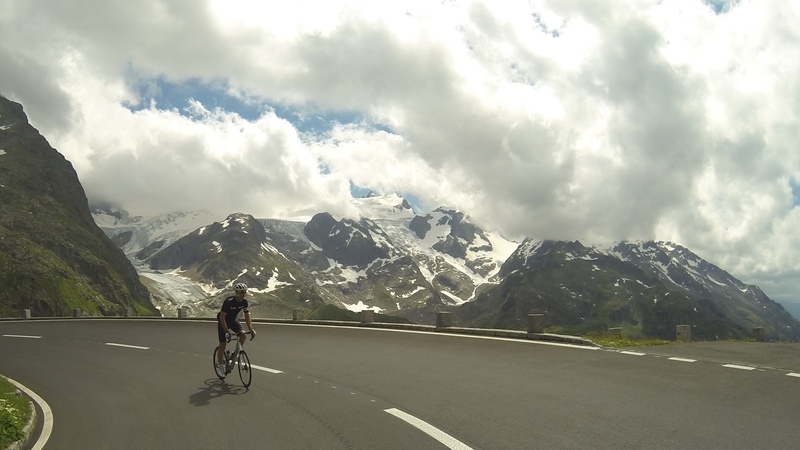 The Alps were sweltering and the asphalt was melting. So, for that matter, was I. Overnight recovery is a miracle. I had no real feel for how much damage I’d done the day before, but Stage Two started OK. 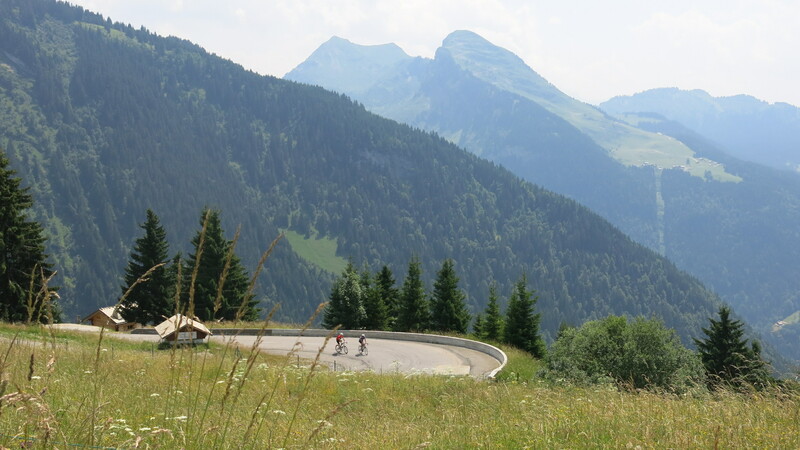 Yes, it was already 30 degrees at eight o’clock in the morning – in the shade – but the Pas de Morgins felt better than I would have dared hope, 12 hours earlier! At the summit, we crossed into Switzerland, therefore validating our Tour de Suisse title. In reality though, this was more of a straight line through the Swiss Alps, from Geneva in the west, to the summit of the Stelvio (three times – more on that later), in the east. In between lay a bunch of iconic, high cols and stats that looked more worthy of a Cent Cols Challenge, than a self designed ‘holiday’. A couple of hours later, part way up the Col de la Croix, my Garmin was reading 42 degrees and my pace had dropped again. But this was the ‘easy’ day at 137km and 2,900m and despite the crazy temperatures, we all made it safely to our overnight stop in Aeschi, close to Interlaken. We had our first glimpse of the Eiger. And our only rain of the trip arrived that evening – a ten minute shower that produced a beautiful rainbow, but did little to cool anything down! Jimi’s attention to detail is brilliant: here we have profiles for each of the climbs on Stage One. For months I’d been imagining how awesome Stage Three might be. On paper at least, it looked like it might be one of my best ever days on a bike (172km, 5,500m – the Grosse Scheidegg, Grimsel, Nufenen and St. Gotthard). First up, the temperature had dropped by 20 degrees overnight! I’d realised something in the last couple of days: I’d always known that I went well in bad weather, but I also now knew that I wasn’t designed to ride in extreme heat. The others seemed to be coping better, but beyond 35 degrees, I just seemed to wilt. So, the cooler morning was most welcome. With Kev, Chris and James a little way ahead, Rich and I cruised up the valley to Grindelwald, catching glimpses of the Eiger and it’s equally impressive neighbours, through the clouds. 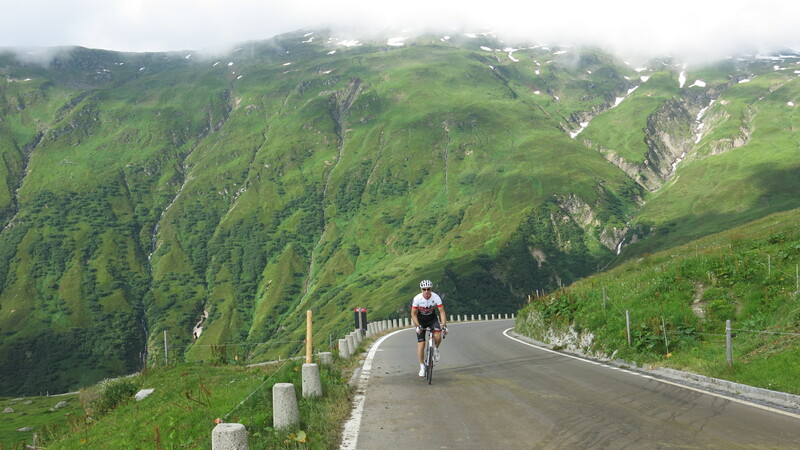 The Grosse Scheidegg is supposed to be one of the hardest climbs there is, but I never found out. The road is so steep and narrow that cars aren’t permitted, so Jimi was taking the long detour through Interlaken, around to the other side of the mountain. Following signs, advice from a few locals and Rich, a few hundred metres ahead, I somehow lost the correct road and headed instead up something altogether much more hideous! By the time I was sure of our mistake, Rich was way ahead and I couldn’t face the idea of losing 1,000m of upward effort, so I just carried on. A 4×4 came past, struggling for traction on a 30% corner. The Zoncolan was easy compared to this and it made the Mortirolo look like a walk in the park! Finally, incredulous at the consistency of the 20 – 30% gradient, I stopped. In fact I stopped three times up this climb and I never, ever, stop on a climb. It was, without doubt, the hardest hill I’ve ever ridden and I sincerely hope I never find anything like it ever again. Eventually, the road flattened, but also turned to gravel for a few kms, before finally descending to the summit of the Grosse Scheidegg, where we found the others sipping hot chocolate in the summit cafe! The descent was crazy, as in steep, technical and poorly surfaced in places, causing me to fear for Chris’s safety as he disappeared into the distance at a speed that defied possibility. As Jimi put it later that day “Chris descends faster than anyone with responsibilities should!” Next up in this epic day was the 32km climb to the summit of the Grimsel Pass. I snapped the temperature on my Garmin at the top: 12 degrees – some 30 degrees cooler than 24 hours ago, but only because we were in cloud, at 2,165m! I sensed the heat was still out there, just a patch of blue sky away! 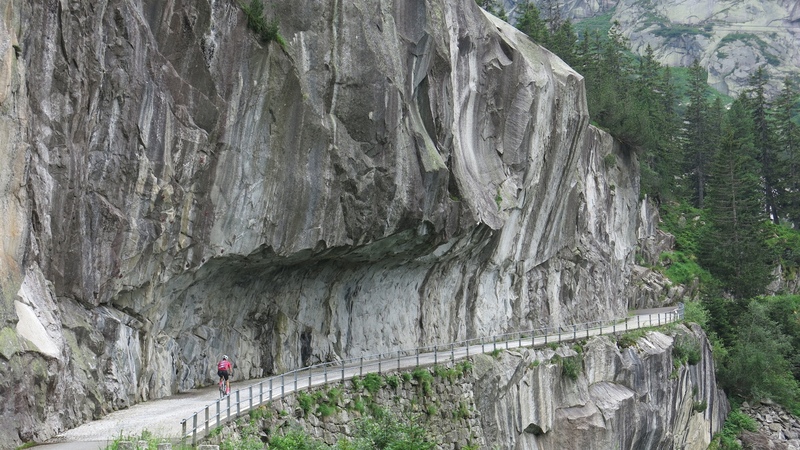 Grimselpass – it may be 32km long, but with traffic free sections on cobbles under rock walls, who cares! SGL flying the Rapha flag. Photo by Jimi Thomson. We descended 20km to the foot of the Nufenen Pass, reputed to be the hardest climb in Switzerland, although I had a feeling that I’d already ridden that earlier in the day! Three kilometres below the summit and happy to accept that perhaps this was the second hardest pass in Switzerland, I stopped and sat down again. Despite the altitude of 2,000m, my Garmin was reading 43 degrees again. The sun was back and I was being slowly roasted once more. I ‘took a couple of minutes’ and then remounted and joined the others on the summit, before a long, fast drop to the valley floor. 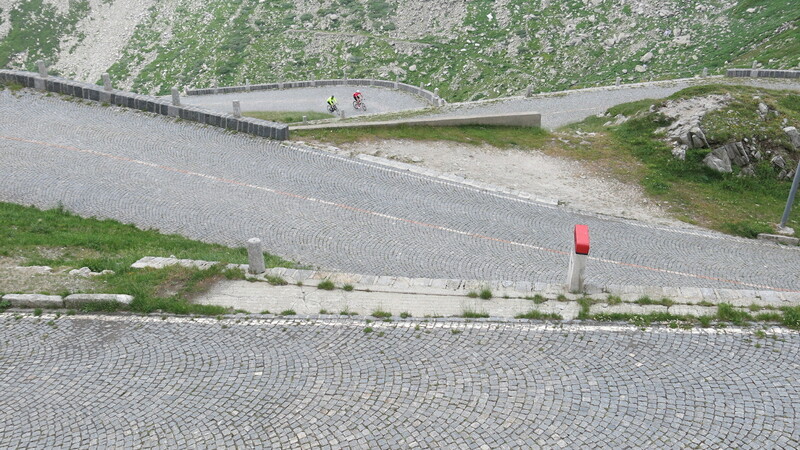 An espresso later, we embarked on one of the world’s most unique climbs: the Tremolastrasse of the St. Gotthard Pass. 12 kilometres of neatly laid cobbles, set our in an everlasting fan pattern. With cloud rolling back in and the temperature dropping by 20 degrees once more, I found myself able to really ride properly and Kev and I soaked up the atmosphere, the incessant hairpins and the wonderful surface. This probably goes down as one of the best days I’ve ever had on a bike, despite the lunacy of the first climb and the ridiculous temperatures on the Nufenen. The Tremolastrasse is something every cyclist should experience in their life, at least once! Tremolastrasse: every cyclist should climb this at least once in their life: Kev and SGL doing just that. Photo by Jimi Thomson. It’s hard to explain how amazing this climb is! Photo by Jimi Thomson. 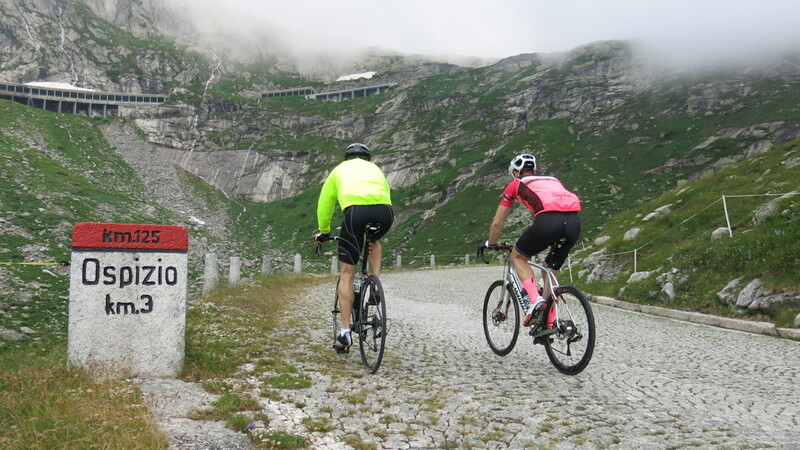 Stage Four was another treat: the Furka-Grimsel-Susten link-up. In just 100km/3,000m, we would climb three of the highest passes in Switzerland, spending much of the day well above 2,000m. Superlatives became the norm and the temperature remained almost workable, only really heating up on the Sustenpass, at 40 degrees. Despite that, the Susten went down as one of the best five passes I’ve ever ridden. Another remarkable day on our Swiss odyssey. Lucy’s jersey and the Furkapass. Photo by Jimi Thomson. Jimi asked Kev to stick close to me in the corner for the photo. At 55kmh in the bend, this was impressive! Photo by Jimi Thomson. Descending the Furka with the Grimselpass looming rapidly in the background. Photo by Jimi Thomson. When I first gave Jimi my outline route, I asked him what I’d missed and his answer was one word: “Splugen.” An hour into Stage Five (170km, 4,000m), I understood what he meant as I flew downhill through an impossibly tight rock tunnel and emerged onto a sheer rock wall, a thousand meters high, to which it looked as though an optimistic engineer had glued a series of asphalt ramps and hairpin bends. Terrifying and mesmerising, all at once. Somewhere behind us, Jimi was having to do three point turns in dark tunnels, just to negotiate the hairpin bends! Jimi had said we had to ride the Splugenpass. I imagined this was why, until I saw the other side. James riding, Jimi chasing in Erika. At 80kmh, this felt pretty interesting. Photo by Jimi Thomson. The Splugen descent. One of the craziest roads I’ve ever seen. Kev, chasing SGL at speeds that are best left unsaid. Photo by Jimi Thomson. Try making sense of this!? 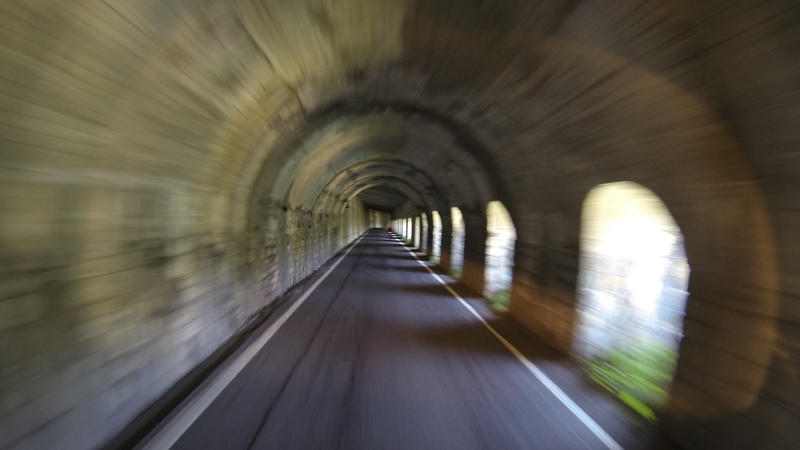 The Splugenpass: madness, or an engineering marvel? Photo by Jimi Thomson. The next climb, the 32km Maloja, was frankly another overheated slog, made worse when a bee decided to lodge itself in my helmet and commit suicide by stinging me. The upside was that it took my mind off the series of 12% ramps that led to the summit! We were now firmly above 2,000m and would stay there for the next 100km. The adverse effects of altitude are really hard to actually feel at c.2,000m, but Jimi had felt this would be a tough day and he was almost certainly right. It was compounded by a race to make the hotel before darkness, so we decided to skip our usual cafe lunch and let Jimi do a quick supermarket shop and then catch us on the slopes of the Bernina. By the time we sat down in a meadow beside the road, we were all in need of calories, not to mention a rest! Maloja Pass: 32km and these bends at the very end. Superb. Photo by Jimi Thomson. Four more passes in the heat, a bit too much Friday afternoon traffic and a high speed front wheel blow out in a darkened tunnel didn’t make me feel much better about life. The final drop to Bormio was however superb and brought with it the luxury of staying in the same hotel for two nights running! Riccardo Green: KOM, Tour de Suisse 2015. Photo by Jimi Thomson. Even on the eve of Stage Six, I had already conceded defeat. 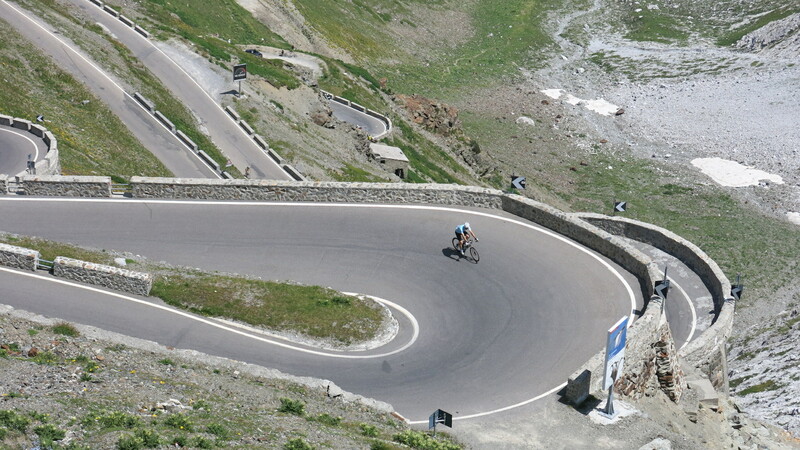 I would try to climb the Stelvio twice in one day, rather than the three times that I’d planned. I checked with the others: Kev and Chris would follow suit, but James and Rich would stick to the original plan and attempt all three routes up this mythical pass. Half way up one of the most remarkable roads you’ll ever ride, as my Garmin once again rose above 40 degrees, I was content with my decision. 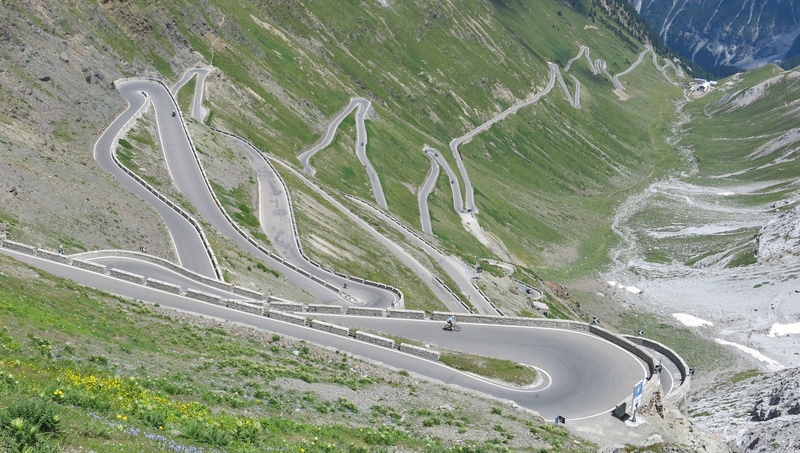 I also vowed never, ever, to return to the Stelvio on a weekend in the summer, as the thousandth motorbike sped past. It was a zoo. This road needs no introduction. SGL melting slowly. Photo by Jimi Thomson. 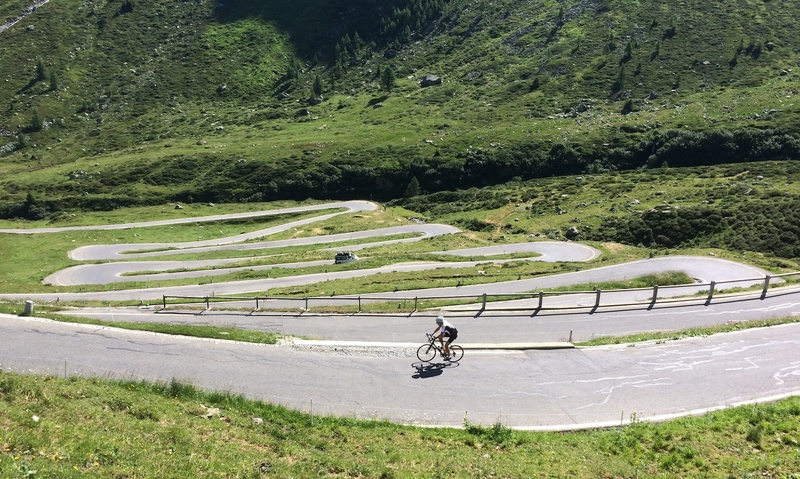 The Stelvio is a cycling shrine, but not on a weekend. I’ll come back early one year, midweek, when the snows have just been cleared and ride it in peace and quiet, as it should be ridden. The END. Photo by Jimi Thomson. Our Tour de Suisse was an amazing trip, beautifully planned and hosted by Jimi. 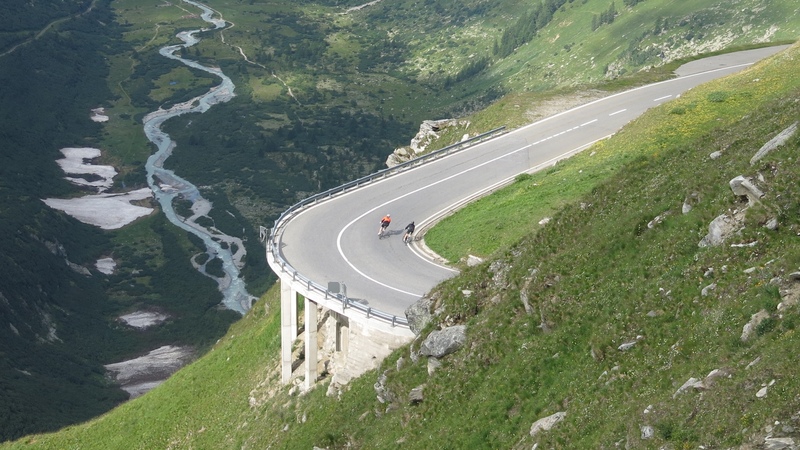 Andermatt in particular is now cemented in my mind as one of the world’s perfect cycling bases for a two or three day trip: you can ride the Furka-Nufenen-Tremolastrasse one day and then the Furka-Grimsel-Susten the next. As ‘mini-trips’ go, that’s as good as it gets. I’ve known for a long time how harsh mountains can be and when you plan these trips, you never know quite what you’re going to get, weather wise. I can cope with cold, rain, wind – I even quite enjoy it! But I also now know that when the needle rises past 40 degrees, I’m relegated to survival mode. Thank you to Jimi & Janine of Two Tyred Tours and to my riding companions: Kev, Chris, James and Rich. SGL, Jan 2016. 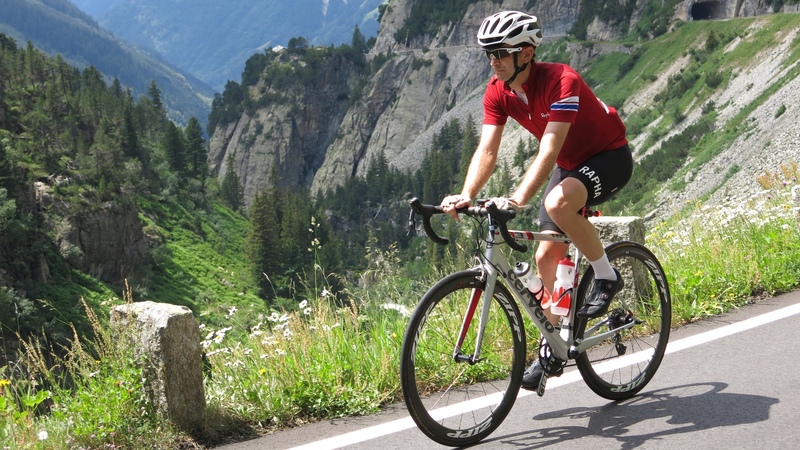 Background: I’d wanted to ride the iconic Swiss climbs for a long time, but it was only when I came across Jimi Thomson of Two Tyred Tours in 2014, that the idea really started to take shape. Jimi, although Canadian by origin, has lived and guided in Switzerland and the European Alps for c.25 years (skiing in the winter and cycling in the summer). He knows the terrain intimately. 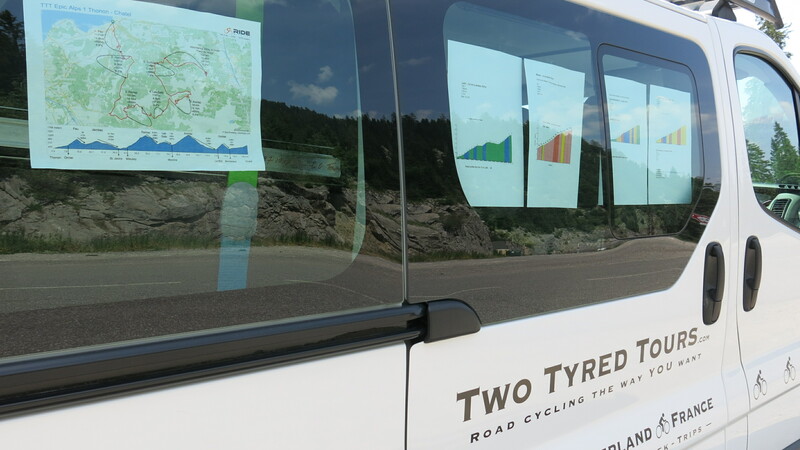 He founded TTT in 2014, with the aim of providing bespoke, fully supported cycling tours. I’ve always had plenty of ideas of where I’d like to go next, but logistical and on-the-road support was a headache. Then I met Jimi, who shares my passion for maps, quiet roads and spectacular mountains. Above all, I love his company and his attention to detail. Suddenly, my theoretical plans became reality and we now try to do at least one bespoke tour together every year. 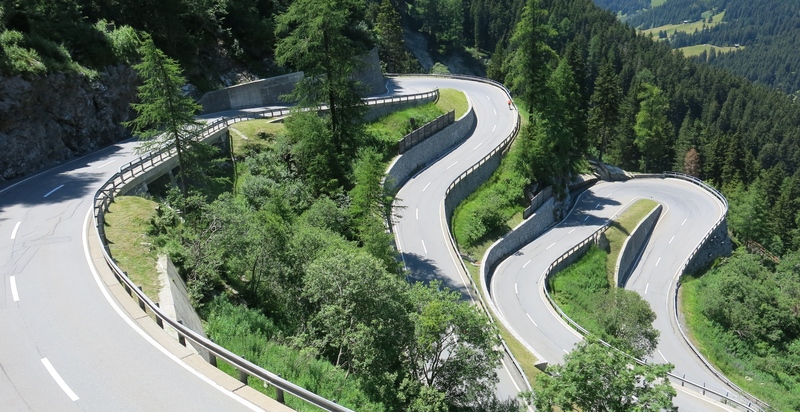 Initially, I imagined some sort of loop from Geneva to Zurich and back, but then Jimi mentioned Splugen Pass as a ‘must do.’ That pushed the route south and east and a look at a map confirmed that the Passo dello Stelvio was then almost within reach. And so the route morphed into a one-way trip, from Lake Geneva in the west, to the Stelvio in the east. 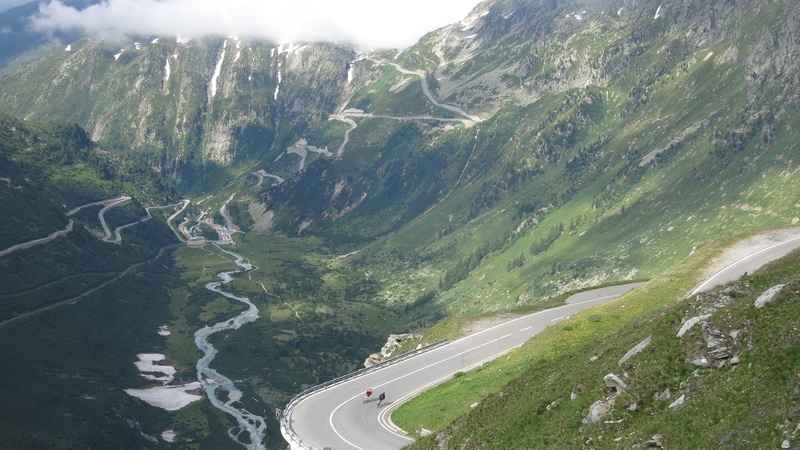 The cols and passes crossed were the stuff of legends: Ramaz (as a replacement for the closed Joux-Plane), Morzine-Avoriaz, Grosse Scheidegg, Nufenen, St.Gotthard, Furka, Grimsel, Susten, Splugen, Bernina, Livignio, and Stelvio. Besides the names, the figures confirmed the challenges ahead: 6 days, c.1,000km and c.24,000m of cumulative ascent. Difficulty wise, that’s nudging Cent Cols territory. A more detailed look at the daily stats revealed the true nature of the challenge: it certainly wasn’t one of distance – only one stage weighed in around the 200km mark. No, our Swiss odyssey was defined by the cumulative climbing and in particular, the amount of time spent at high altitude: of the 18 major passes crossed, 14 were above 2,000m. To put that into perspective, the Raid Pyrenean only reaches 2,000m twice and even the mighty Route des Grandes Alpes only goes above 2,000m on five occasions. Splugenpass: glaciers, altitude and grand scale. SGL into thin air. Photo by Jimi Thomson.